The adapter is powered by the camera body, no external power source is required. Compatible with EF-S lenses, however vignetting at corners may occur for certain EF-S lenses because they are designed to cover a 1.6x crop image circle and Sony NEX has a 1.5x crop sensor. Compatible with Sony NEX full frame cameras such as the A7 and A7R. The Mark III adapter supports auto "APS-C Size Capture" with EF-S lenses as well. Canon EF Lens to Sony NEX Camera Lens Mount Adapter III (Black) is rated 4.1 out of 5 by 46. Rated 4 out of 5 by Antonio N. from Canon lenses with Sony A7r a greet Combo This metabones adapter allows me to use the Canon lenses I own with the new full frame Sony A7r. Considering the limited Sony Lenses currently available and the good IQ of Canon lenses I can have a wide choices of glasses to use. The adapter has good electrical connections for aperture, autofocus and IS functions. note- initially the adapter was very tight for the 17-40 mm L lens and the 100-400 mm L lens, no issues with 24-105, 70-200 F2.8, 85 and 50 mm. I sent an email and B&H offered to replace the unit, while Metabones Hong kong offered to send a new plate, which I received within three days. With the new plate I installed myself, all the lenses now are fitted well. Rated 5 out of 5 by Paul the Nature Enthusiast from Awesome I have a decent collection of Canon lenses, but love the handling of the NEX-6 (won't replace my 5DMII!!!) for certain things. This device fills the gap providing an almost seamless use of my EOS lenses on the NEX. The image stabilization and setting exposure works, however the autofocus is so-so (certain lenses can hunt) -- however I do not blame this product, but the difficulty in combining these two systems. Mostly I use manual exposure and manual focusing (doesn't everyone? If not, why not?) so the iffy behavior with automatic focusing is a non-issue for me. To be clear, it works, but won't perform well for moving subjects or under low lighting -- you may have better or worse results depending on the lens. And in fairness, the manufacturer discloses this issue. The biggest drawback is that you can see for yourself how much better the Canon lenses are than the Sony E-Mount lenses -- even the 35mm prime is noticeably inferior to its Canon counterpart. The dream here has come true for me: great lenses that I love on a camera that provides focus peaking (almost like using rangefinder, but better) and live exposure histograms (manual made easy). Rated 3 out of 5 by Tino from Works 100% with selected lenses. I have only 5 Canon EF lenses to try with. None of them was compatible. My Canon EF-S 55-250mm works in relation to focusing and stabilizing. However, as expected, vignetting is prominent when fitted to my Sony a7. Somewhere in the internet I've read Metabones document where they listed brands models that fully or partly works with the adapter. In fairness to Metabones I do not have the lens that works 100% with it.I bought the Adapter mainly as a cosmetic upgrade to my a7. Besides, I prefer manual focusing for video and photography of which the Metabones Adapter III (Black) works very well. Rated 5 out of 5 by Rab Adam from I like it. Just attach to the Sony A7 and hey presto it works, as long as you use a suitable Canon lens. I use MF so it works on all mine however I did try the 50mm f1.4 on AF and AF didn't work, no problem with the 40mm f2.8 pancake or the 16-35 L. Will try the other lenses when I get back to Scotland although I do not want a heavy lens on this camera. The adapter feels good quality and I have confidence it will last for years, for me it is a no brainer to purchase if you have decent Canon glass and a Sony A7 or A7r. Rated 4 out of 5 by Don S. from Works - the 2nd time around Great product. First one that came had a defect but we returned it and got a refund very promptly from B&H. Very easy return and quick response. The 2nd one came and worked perfectly. Rated 5 out of 5 by davide291 from Works good! Am using it on Sony A7R with Canon EF 40mm Stm, EF 24-70mm II L and EF 70-300mm. When you are shooting in video mode with the Sony NEX 7.Does this product give true correct Auto Aperture control in Shutter priority mode ? This Metabones product would give the correct auto aperture control in shutter priority when shooting video on a Sony NEX 7. This adapter will work fine with my NEX 7 + Di II VC PZD AF Lens for Canon ? ?I want full range zoom in my nex7 without loss the autofocus, aperture control and Image stabilization.What you recomend for my nex 7? Does this adapter support full frame on the Sony A7? Is there a crop factor? There would be a crop factor if a Canon EF-S lens is used on the adapter. It the lens is for full frame use, like the EF series, then it will remain at it's proper focal length. How to choose Green or Advanced function? Are those functions available in camera menu? Firmware upgrade is made through camera? At what extent are auto-focus velocity is compromised by this adapter? At green mode how much of the auto-focus and stabilization are compromised? The Green mode is used by default on the Metabones Canon EF Lens to Sony NEX Camera Lens Mount Adapter III. You select the operation mode when you mount the lens. To check the adapter firmware version of your adapter, attach any Canon EF lens to the adapter and put it on a Sony NEX camera body. Press the 'MENU' button and choose the 'Setup' icon. Find the 'Version' function in the list. Metabones Smart Adapter firmware upgrade is a factory service procedure. No user-installable update is available. Please ship your Smart Adapter to Metabones if you require a firmware upgrade. Autofocus speed is very slow and inadequate for most moving subjects. For both Green and advanced modes, the autofocus speed is unfit for professional use for sure, and it would disappoint most enthusiasts, and additionally, continuous autofocus is not supported. Image Stabilization is supported. 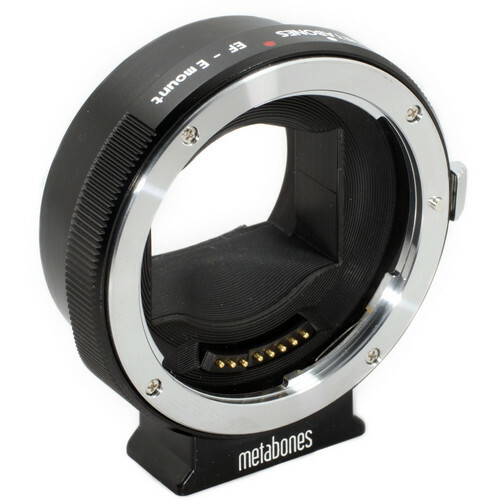 Yes, the Metabones Canon EF Lens to Sony NEX Camera Lens Mount Adapter III will be compatible with the Canon EF 85mm lens and the Sony Alpha 6000. Does this work on the A7R? Yes, this adapter is compatible with the A7/A7r cameras. Will this adaptor work on my Sony NEX 5N? ie with autofocus? The Metabones Canon EF Lens to Sony NEX Camera Lens Mount Adapter III will allow one to mount EF mount lenses on an E mount camera such as the NEX-5N. The adapter will also allow for autofocus with Canon-branded lenses introduced in or after 2006. Autofocus may be disabled for older Canon lenses and most third-party lenses. Yes that is the same adapter.